One of my favorite ways to preserve food is to seal it in Mylar bags and store them in food grade buckets. 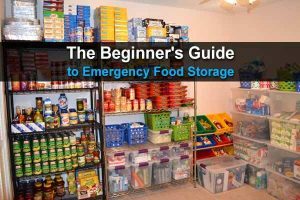 With this method you can store a lot of food in a small space, your food will have a very long shelf life, and you can reuse the buckets as many times as you want. But there’s another bonus to using buckets that many people forget: In a long-term disaster you can use them for all sorts of other things. 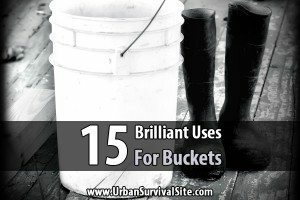 This post describes 15 uses for buckets, and after you read it you’ll never throw a bucket away again. You can always buy buckets online or at a home improvement store, but there are many cheaper alternatives. I just did a search for buckets on Craigslist and found several for a couple dollars each in my area. 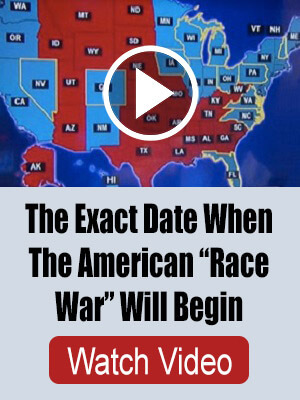 Chances are you can find some in your area, too. You may also find them for as little as a dollar at your local flea market. If you’re a smooth talker, you might be able to get some buckets for free. Restaurants, grocery stores, bakeries, delis, coffee shops, doughnut shops, and most other places that sell fresh food might have leftover food-grade buckets they don’t need. You could also check car washes, construction sites, gas stations, soap makers, wine stores, and anywhere else that uses buckets. But if you get buckets from any non-food-related businesses, don’t store food in them unless you’re sure they are food-grade. Although most of the uses for buckets listed below will work with any type of bucket, you still need to know how to tell the difference between food-grade and non-food-grade so you don’t mix them up. First, look at the recycling symbol on the bottom. There should be a number between 1 and 7 inside a triangle made of arrows. The numbers that indicate food-grade are 1, 2, 4, and 5, but the best is 2 because it means the bucket is made of high-density polyethylene, one of the most stable forms of plastic. If there isn’t a number on the bottom of the bucket, check for other symbols such as a cup and fork (food-safe), radiating waves (microwave-safe), or a snowflake (freezer-safe). All these indicate the bucket was designed to contain food. If none of those symbols are there, look for a price tag or manufacturer’s label for information. If you can’t find any indication that the bucket is food-grade, do not use it to store food or water. Some plastics could leach harmful chemicals into your food, and that is not worth the risk. Now on to the list. Large metal buckets are great for making rocket stoves. In case you don’t know, rocket stoves are cheap to make and incredibly efficient. They heat up food and water very quickly and run on small branches and twigs. If you’ve never built one before, here’s how. A few buckets and some PVC pipe can be used to build a biosand filter. With these, the water filters through gravel, sand, and charcoal and comes out free of heavy metals, bacteria, and viruses. 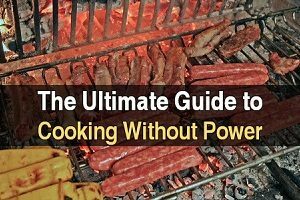 It only takes a few pounds of charcoal and lasts several months before you have to replace the charcoal. This PDF has detailed instructions. If there is no running water, you might have the carry it from the nearest source. Buckets are the best thing for this. Even if you have a wagon or something, you’ll still need buckets. Jars and pails are usually too small. Another thought: If there is a flood, you can use large buckets to bail water. If garbage collection companies become unreliable or cease altogether, your trash will pile up quickly. To save space until you can properly dispose of it, use two 5-gallon buckets as a trash compactor. Simply put the trash in one bucket, then put the other bucket in the first one and push it down with your foot. This will halve the space taken up by your trash. If you don’t have a fire extinguisher, buckets are a good alternative. Use them to pour water or sand on a small fire. Obviously, this won’t be enough if your whole house is ablaze, but if you keep a couple buckets near your grill and campfire, you can stop fires before they get too big. People have been known to grow entire gardens in 5-gallon buckets. To make this even easier, you can build several Alaska Grow Buckets and connect them to a water reservoir that only needs to be refilled every week or two. Put buckets at the bottom of your gutters and use the water to wash clothes or water your garden. You might be able to drink this water provided your roof isn’t too dirty and you filter the water. This post has more information. Get two black 5-gallon buckets, put one inside the other, fill 2/3 of it with water, put the lid on, and place it in direct sunlight. After an hour or two (depending on the temperature outside), you will have a bucket of nice, hot water. It might even be a little too hot, in which case you can add some cold water (this is why I don’t recommend filling it all the way). Don’t drink this water or use it for cooking unless the buckets are food grade. You can attach straps to a bucket to turn it into a backpack, or you can just purchase a bucket backpack like this one from Academy Sports. This would be very useful while gathering food or supplies. Pour a few scoops of kitty litter into a 10-gallon trash bag and put it in a bucket, then sit down and do your business. Here’s more info. The only problem is that you can’t exactly sit on a lidless bucket, and it’s difficult for some people to squat over one. The solution is this toilet seat which was designed to fit on most buckets. It’s surprisingly comfortable. If you have backyard chickens, you can use buckets as chicken feeders and waterers. Just drill holes near the bottom edge, put the buckets in foil roasting pans, then fill the buckets with chicken feed or water. You can also turn buckets sideways, cut away 2/3 of the lid, and put straw in there to make some good chicken nesting boxes. Here’s how. If you have supplies that need to stay dry (paper towels, toilet paper, kindling, fire starters, tinder, etc.) but you want to store them in the garage or attic or somewhere they could get wet, just seal them in air-tight buckets to keep out rainwater and humidity. A pallet of 5-gallon buckets (3 wide and stacked 3 high) full of drinking water would last the average family at least a month and wouldn’t take up much space. Just be sure to put the pallet on a concrete floor and make sure they are food grade buckets. This video explains how you can make a camp shower using a 5-gallon bucket, some PVC, a PVC ball valve, and a nozzle. With a low-flow nozzle, it can last up to 8 minutes before you have to refill it. Put your clothes in a bucket along with hot water and detergent and close it with a Gamma Seal Lid. Shake the bucket back and forth for a few minutes, drain the soapy water, wring out your clothes, and repeat the process with fresh water. Here are more detailed instructions. As you can see, buckets are very valuable during a major disaster. I’ve heard that in third-world countries buckets are so valuable no one would dare throw them away. Don’t let this versatile tools go to waste. I have a flat portion of roof and the roof drains freeze over in the winter, I am thinking a black bucket upside down with areas cut out on the lower rim for water to flow would keep them open as the sun hits it in the winter. a cinder block on top should keep it in place. Anyone ever try this? Have been using a bucket to wash clothes in my RV for 40 years if water is short don’t rinse just use less detergent dry overnight under awning, Happy travelling! Washing cloths I use a BIG potato masher. Got one at an Army Navy surplus store about 2 feet long and 8 inches square. Small hole in the top of the lid and off we go! Drywall mud mashers work well too. I get my buckets from the bakery at Krogers. If I call at 6 A.M. they will save them for me for an hour or two. I just have to clean the frosting out of them. Tidy Cats buckets used for cat litter are food safe, very sturdy,with hinged lid and handle. Ask a friend with cats that uses that brand to save them for you. The cat litter and store brand laundry detergent buckets are food grade, rectangular and space saving. Once they are washed they are very handy. Use them in pantry, food storage, craft storage,etc. Also use the litter ones with hinged lid for pet food. Have never thrown one away, and have seen some people throw them out with trash. A Little soap and water works wonders. One man’s trash is another man’s treasure. Another possible use would be to use your buckets to make ice in the winter if you don’t have access to a pond, but you want to set up your own ice house. Fill your water buckets half to 2/3rds full, (because ice expands) and leave overnight to freeze. Pack your giant ice cubes in sawdust or straw to keep them frozen. You could also reuse gallon water jugs, and if they’re clean and you use potable water you can drink the contents after it melts down. Keeping the ice in the containers also keeps your ice box or cooler from needing a drainage system/drip tray. Of course, you’ll need a lot of containers to make this worthwhile, but in an off grid situation it should work well enough to justify trying it out. 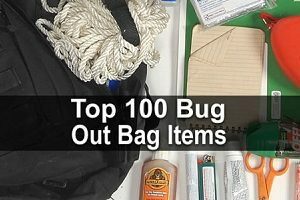 Buckets can be used to hold emergency evacuation supplies, such as 2-3 changes of clothes, solar radio, pocket knife, solar lantern, extra meds, etc. We keep one for each family member & pet (name on bucket) stacked where we can grab & go, & rotate contents seasonally. Turn your bucket upside down,,sit on it, and think of all the possibilities! Storing water for an average family for a month will take a lot more than 45 gallons. Use 3 55 gallon food grade containers. Also, use 2 buckets to make paper fire logs. put paper in one, add water sand stir, Cut holes in sides near bottom of the other. Press the second one into the first and drain the water. cut the paper bricks into smaller sized logs. The problem with 55 gallon barrels for water storage is portability and algal growth. One gallon of water weighs 8.33 pounds, 5 gallons weighs 41.65 pounds and 55 gallons weighs 458.15 pounds, not counting the container. Plus you still have to transfer the water to the dahmer barrel (Milwaukee speak for these plastic food grade 55 gallon barrels as Jeffery Dahmer used one to dispose of body parts in one filled with acid). You also have to have the hand pump to get water out of them. Sadly nothing is ever as easy as we want it to be. A hint on making paper logs, presoak the paper, and pulp it up with a paint mixer of the type used in an electric drill (use a hand crank drill or a brace)and if you have it available, add some dish or laundry detergent, preferably liquid or powdered dissolved in hot water, as this will break down the papers binding agents and allow it to rebond with the new pulp you are making, adding to the quality of the paper mache’ like bricks you are making. If you are industrious you can also make a roller and use full wet sheets of newsprint to make logs. or if you weld, you can make a rectangular press. Back in the day when I was a scoutmaster and the price fell out on newsprint, We still kept up the paper drives for recycling first for making our own “wood” for camping, using this method, as well as supply a local factory that would give a generous donation for the open clean sheets to use for shipping packing material. Im not picking on your post! You just hit on two of the most important Ideas so I’m sticking with your lead! On the topic of water, skip the complete nome brew Water filter Since we have to get the buckets before hand, Go to the local home improvement store and pick up the necessary fittings and tubing to attach the ceramic and carbon filters you can pick up there to build a much better water filter, that is in the exact same class at the filters you pay several hundred dollars for online for in your survival gear dont forget to keep track of how many gallons of water you are putting through them so you know when to replace them with the replacements you have also purchased. No they are not cheap, but after you purchase the primary set and one replacement set, you can sit back and watch for them to go on sale and stock up after that, as you will be covered for at least 6months to a year, and if you have to you can build the gravel & sand filter to prefilter really cloudy water. A five-gallon bucket can also be used as stilts for reaching or working on things overhead. The drywall repairmen we hired placed standard home improvement store five-gallon buckets, without lids, upright on our hard surface floors, then stood on the rims, balancing with one foot on each side. They could “walk” the buckets around the floor as they worked, without having to get down from the buckets. What great ideas! Thank you, like the garden one too. Michelle, how do you make you’re own laundry soap, would like to try. For #10, the toilet. Rather than buy a toilet seat for this, make one by splitting (halfway through) a pool noodle and fit it around the rim for cushioning. Cheap, just a buck at dollar stores. It all sounds good except shaking the bucket to clean clothes. That’s really impossible.Water is too heavy. I have to wash my clothes by hand and I’ve tried everything. You could if you wash one or two shirts, but not jeans and towels. Best to use the bucket with a long stick and swirl clothes. Buy a toilet plunger to wash the clothes. Make a hole in the lid for the handle to pass through .Add clothes ,water,soap and plunge away. Agree with the toilet plunger, just make sure it’s NEW. Much easier to leave the bucket on the ground. I use a plunger in a bathtub of soapy water for washing small throw rugs. You can use a bucket to wash a lot of clothes, even jeans. Pour water and detergent in it. Stand and use your leg and foot to wash them, not your hands. Just put the bucket in your car or truck, fill with clothes , water & soap, press on the cover . Drive around, do errands , go to work. By the time you get home, the clothes will be much cleaner. Just pour out and add fresh water to rinse. Just a bachelor- lazy- man style. Works for me ! Lol that’s funny…Im going to try this out. I’m always looking for short cuts that free up time allowing me to get more done in the time I’ve saved! Thanks for the hack! I doubt in a survival situation that there will be plentiful fuel to waste driving around the neighborhood in order to wash your clothes.There may not even be much water available for washing clothes…only drinking, cooking and bathing use. why couldn’t you use a toilet plunger to wash your cloths, the up and down motion is a lot less work and saves wear and tare on your arms and hands. we are a food plant and we throw about pails constantly. More info please? what state, and/or town? I would like food grade buckets that are being tossed out for free. But, where is this located ? I am in central Ohio, and bet you are not near. #4–also use scissors on anything you can cut successfully. A toilet seat can be made by using a pool noodle. Cut a large slit the length of the noodle, put it on the top of the bucket for a cushion. Cut residual noodle. In a SHTF situation yo NEED to kill the rodents to prevent disease vectors from affecting humans. if they have been living in close proximity to humans consider them infected with anything that we can get allowing them to be eaten by any other animals just increases the possibility of creating a pandemic, even if one hasnt started yet, just look at whats happening right now with the flu. The wild and free usually translates to farmers and do you want them in your food supply. The old saying that if you see a mouse or rat there are 100 more that you can not see. For us older folks who can’t easily pick up and shake a bucket with water and clothes, I have the 5 gal bucket and lid, but I cut a small hole in the lid that will allow the handle of a toilet plunger to fit through, fill will soap and water and clothes and plunge away, drain, fill with more water and repeat to rinse out. The bucket toilet is a game changer for anyone who can’t squat. The seats are a huge improvement as well. However, in many outdoor places ie camping or the back yard after a disaster makes using the indoor plumbing unusable, you can separate purposes by using two toilets. 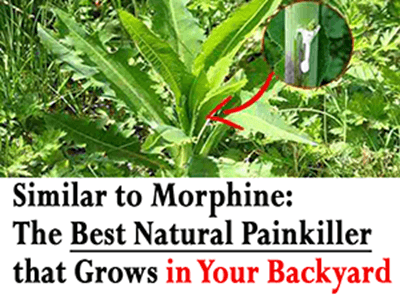 For urinating, wear heavy gloves for safety, use a big knife to cut a hole in the bottom of a plastic bucket, roughly 1/3 the diameter, and add several small boulders or bricks for stability. If possible, set it up near something solid, like a post, tree, or corner of a building so people who are unstable have something to grab as they get down and back up. For the other bucket, add kitty litter. If you can double bag that one, so much the better for disposal. Of course, you are best off keeping the toilets away from your source of drinking water. Get an eight or ten foot length of 4″ diameter pvc pipe. Drill holes all around the bottom 18 inches of the pipe. If you don’t have a drill, you can heat a metal rod and melt holes. Dig a hole and bury 4 or 6 feet of the pipe in the ground. If you have pea gravel, put some pea gravel in the bottom of the hole. You now have a tube that can be urinated in. If you wire a piece of screen on the top of the pipe, you will keep insects out of the pipe. If you have a well or a spring, of course, the tube should be located away from your water source. I’m thinking for us older folks revisiting the old-time commode chairs might work. Essentially it’s a wooden box with a door in the front for removing the waste/cleaning, with a hinged lid covering a hole. You can see really fancy ones in museums and antique shops, but the box approach is adequate, especially if your woodworking skills need practice. Last winter my well water line froze up and as I live in central Minnesota It was buried over 4 ft. deep and frozen solid. Also plastic pipe so thawing it with A welder wouldn’t work. I was out of luck for indoor plumbing for about 2.5 month’s! I had an old wood cabinet that I got at an auction so I cut A hole in the side and put A plastic trash bag liner in A plastic bucket. It worked like A charm and as I live alone I only needed to change the liner once A week. I tore up newspaper to put over my filth and always urinated in an empty laundry detergent jug before using the “outhouse” that was housed in my basement bathroom. I used the toilet seat off the basement toilet. I put the bagged excrement in the trash every week ( my area burns all it’s trash in steam boilers for disposal) and took the urine jug to be emptied in the woods when I went to get my mail. I hope the water line don’t ever freeze again! Apparently I can’t go away for any length of time in the winter!! use a piece of pool noodle onthe top of the bucket for a easy potty seat. To heat water faster in a bucket paint the outside flat black it will not only get hot but REALLY hot. OOOrrr…just have some black ones, bought already…now I can do something else, with the black paint. the flat black paint will cause the water to heat substantially faster than the plain glossy black plastic will due to the reflective surface of the bucket, and sanding the surface of the bucket will cause it to break down substantially faster as it will allow the plasticizers to leach out of the bucket. Enquiring minds wanna know…HOW do you make your own laundry soap? There are many recipes, but I mix together equal parts borax, washing soda, and grated bars of soap. Then I use two heaping tablespoons per load. Works great! what is your recipe for laundry soap?? Not sure if it’s a survival tool, but as kids we made a raft out of 6, 5-gallon buckets (with lids, obviously) and some 2x4s… the buckets were the ‘pontoons’…2x4s were tied in place. Can’t think of a reason I’d need it if the SHTF, but it worked great going down Mill Creek with 3 kids aboard! Best bucket article I have read! Thanks for the ideas. I downloaded the water filter PDF and shared your post with my friends!